Editors note: Homegrown Alaska is a new column that will profile farms and farmers of Interior Alaska. The column will appear every other week. FAIRBANKS — “This happened by accident,” Mike Emers tried to explain. As a young person growing up in Rhode Island in a family interested in gardening, Emers always expected there would be a garden in his future, but he never imagined he’d one day become a farmer and own Fairbanks’ largest community supported agriculture business. His parents appreciated good food, so they always had a garden and Emers was expected to help out. The rest of his free time was spent collecting baseball cards. In his late teens and early 20s, Emers found mentors in “back to the land” folks. “They were self-reliant and that really appealed to me,” he said. Today he is living that unpredictable dream alongside his wife, Joan Hornig, and their two young children at Rosie Creek Farm. Professing a lifelong “big love for the outdoors,” Emers majored in geology at Earlham College in Indiana, where he lived a “groovy granola” lifestyle in the Agriculture Living Learning House. He worked as a ranger at Gates of the Arctic National Park and Klondike Gold Rush National Historical Park before going to the University of Washington to earn a master’s degree in botany. He was a botanist at Denali National Park for a summer and at the Arctic National Wildlife Refuge for seven years. “I always had a garden and I would ask other people to water it for me when I traveled and it always died,” Emers recalled. After settling in Fairbanks, Emers frequented the Tanana Valley Farmers Market where he formed a friendship with Pete Mayo of Spinach Creek Farm. Mayo convinced Emers to take up farming, which he eventually did, quitting his day job to launch a flower business in 1997. He bought 50 acres, cleared some land and set about growing flowers, an endeavor that proved terribly labor intensive. 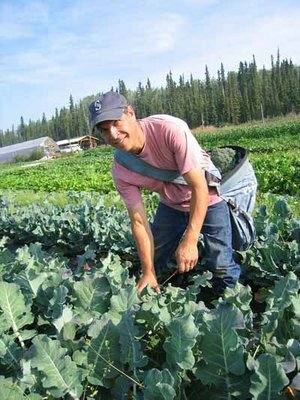 He formed a flower CSA (Community Supported Agriculture) in 1998 and added vegetables in 2002. Gradually his membership has grown to 160. One of his favorite crops, escarole, is something he doles out sparingly because many people don’t like its bitter taste or don’t know what to do with it. Rosie Creek provides customers with tips for using the crops and recipes in every package. He practices letting fields lie fallow in alternating years to rejuvenate the soil. Emers is also big on grafting, which produces hardier stock and plentiful yield. He is assisted by three interns, who not only work the farm but also take classes and field trips. They live on the property and assist with everything from weeding to producing newsletters. While obviously content with his lifestyle, it does not come without challenges. Tractors break down; wells require maintenance. “I worry about money all the time,” he confessed. One of his greatest challenges is having to know about so many aspects of farming and running a business. “Most of the time you will be doing things you don’t want to do,” he said, explaining that he spends more time at his desk than he would like and would prefer to be pulling chickweed beside the interns. “One of my biggest challenges is weeds,” he said. This column is provided as a public service by the UAF School of Natural Resources and Agricultural Sciences, Agricultural and Forestry Experiment Station. Nancy Tarnai is the school and station’s public information officer.